A number of classic effects come under the umbrella of modulation. We explain how to tell your vibrato from your chorus and your phaser from your rotary speaker. Modulation, in stompbox terms, generally means adding inaudible electronic information to components in the signal path to create audible effects. In our feature on tremolo, we explained how an oscillator circuit generates a varying voltage to modulate valve bias or a light source alters volume. This is called amplitude modulation, but when we use the term “modulation”, we’re usually referring to pitch. Parameters such as phase, frequency and delay can also be modulated to create effects such as vibrato, chorus, phasing, flanging and more. So, let’s look at the way modulation effects evolved. Pitch modulation is commonly known as vibrato. Designed to be used with Hammond organs, the first electronic vibrato devices were rotating speakers. Introduced in 1940, Leslie speaker cabinets featured onboard valve amplifiers with a spinning horn and a rotating cylindrical baffle for the bass. Rotating speakers rely on the Doppler effect and the result is a spectacular and complex mash-up of pitch modulation, tremolo and phasing that sounds amazing on electric guitar as well as organ. Check out the arpeggios in Badge by Cream, Hendrix’s Little Wing solo and Buddy Guy’s playing on Junior Wells’ Hoodoo Man Blues. Several other companies have made rotating speakers, with Fender’s Vibratone having been used by some high-profile players and the Yamaha RA-200 a long-standing favourite of David Gilmour. Leslie fans who are not served by a team of roadies might check out the Strymon Lex, Boss RT-20 or the valve-driven Hughes & Kettner Rotosphere instead. Like tremolo, vibrato can be produced electronically as well as mechanically. Just after World War Two, Hammond engineer John Hannert developed a vibrato using an electronic delay line to modulate pitch. 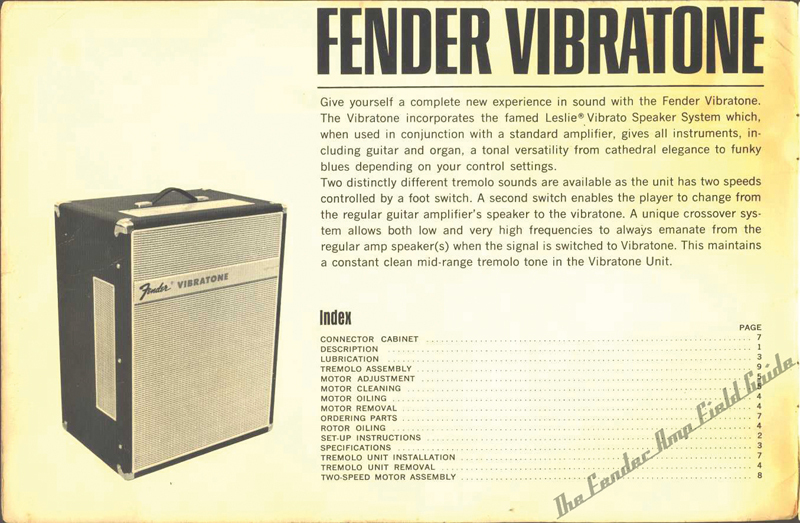 Although Gibson introduced a standalone vibrato effect unit called the GA-V 1 in 1956, most vibratos were built into amps and employed valve circuitry. Most revered is the Magnatone vibrato used by Duane Eddy and Lonnie Mack, but the effect sounds closer to a pitch-shifting tremolo or a rudimentary chorus. Compared to tremolo, valve vibrato circuits were complex and expensive to make. Transistors made it possible to build smaller and cheaper vibrato effects into stompbox enclosures. Typically, these pedals had only speed and depth controls. In their simplest form, vibrato pedals use an array of capacitors to create a very short analogue delay. There will also be an oscillator that modulates the delay time. Much like the Doppler effect, as the delay time increases and decreases, the pitch changes accordingly. Vibrato effects were popular with surf and 60s garage bands. For a vintage Magnatone-type vibrato, the Bigfoot Magnavibe has a lot of fans. Vibrato enjoyed a low-key comeback among shoegazers and Brit-poppers, with the Boss VB-2 featuring on a lot of 80s and 90s records. Many players have discovered they can get good vibrato effects from their chorus pedals because vibrato and chorus are so closely related. Chorus pedals are based on John Hannet’s work during the 1940s when he created a simple ‘chorus’ effect for Hammond organs. The trick is to combine the pitch-modulated and dry signals. The Boss CE-1 Chorus Ensemble was the first Boss stompbox, as well as the first commercially available chorus pedal. The circuit first featured in the Roland JC-120 amplifier, with the stompbox version following in 1976. The depth and rate controls still came under the vibrato bracket and the chorus/intensity control balanced the wet and dry signals. It even had a second footswitch to toggle between chorus and vibrato. Before long, the sizable mains-powered CE-1 enclosure had evolved into the smaller CE-2 – minus the vibrato option. By the end of the 70s, almost every pedal manufacturer was making a chorus of some sort. All this was made possible by the development of bucket brigade devices (BBD). These were chips that could store packets of charge and move them along a line like buckets of water. The number of storage cells and the clock frequency determine the delay time. Previously, engineers had been forced to use multiple capacitors to delay the signal, but classic BBDs such as the Phillips TDA1022 held several hundred stages on a single chip and so achieved longer delay times. 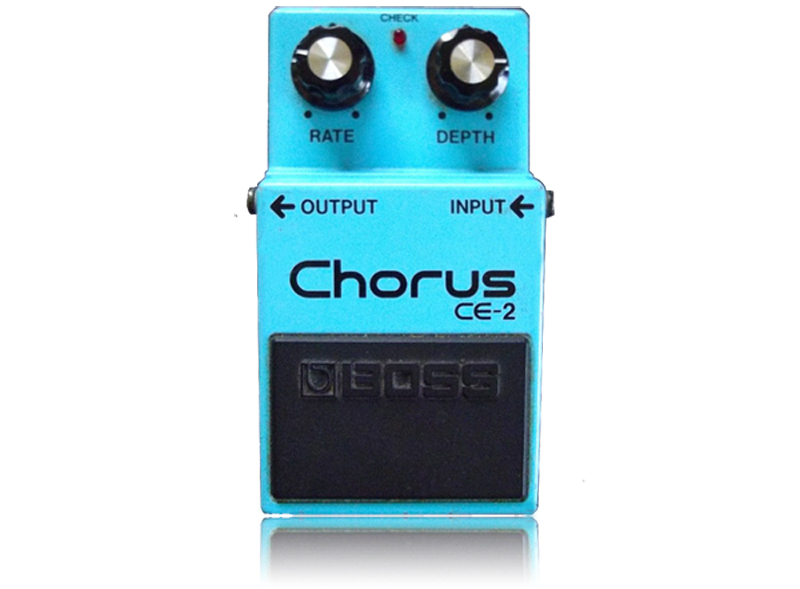 Many of the chorus pedals that followed were great in their own right, but all are derived from the CE-1. Chorus was intended to add richness and complexity to guitar tones, in much the same way that a 12-string guitar differs from a six-string instrument. Flanging started as a studio trick engineers performed with tape machines, and you may have heard it on Itchycoo Park by The Small Faces. With two reel-to-reel machines playing the same material in sync, one machine is slowed using gentle hand pressure on the tape spool. This introduces an extremely short time delay – much shorter than vibrato and chorus. Comb filtering results, where some frequencies are phase cancelled and others are reinforced. If the frequency response is plotted, comb filtering shows up as a series of narrow notches – like the teeth of a comb. At this point, the effect isn’t like flanging, but you can hear what it sounds like by using the ‘filter matrix’ setting on an EHX Electric Mistress. Tape flanging worked because it’s impossible to maintain consistent finger pressure and the delay fluctuates. To achieve a swooshing flanger effect electronically, the delay must be modulated and the delayed and comb filtered signal is then mixed in with the dry signal. Phasing is closely related to flanging but more complex. Delay-induced phase shift is combined with all-pass filtering, so the delay time is not constant across the audio spectrum. Phasers generally have multiple stages that are added to the delay line – hence the MXR 45, 90 and 100. Modulating the filter frequency creates the phasing effect and as filters are capacitor/resistor networks, that means modulating the resistance value. We’ve covered the main modulation effects, but there are others. 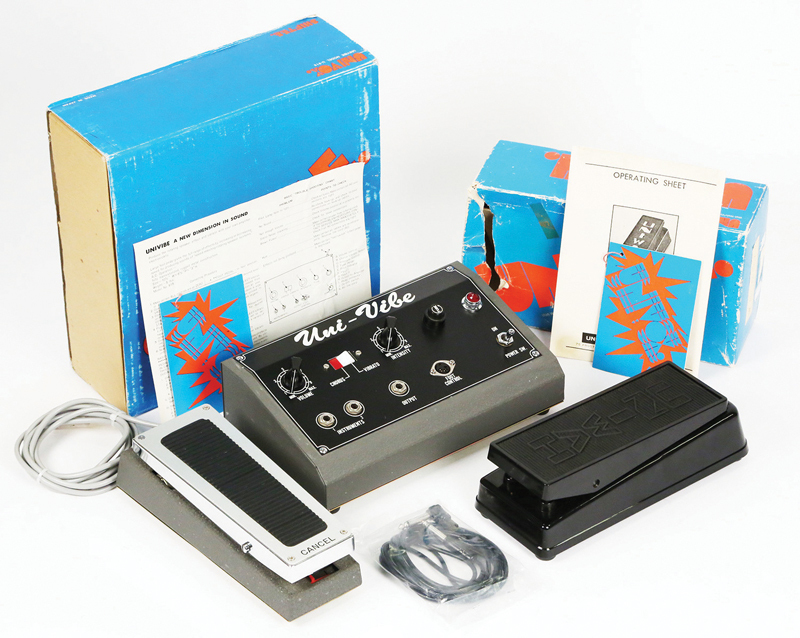 The Shine-ei Uni-Vibe has played a huge part in the history of rock guitar and was a favourite of Hendrix, Robin Trower and David Gilmour. Although there was a chorus/vibrato switch on the front, it was also a four-stage phaser with photo resistors. Read our picks of the best modulation pedals here.